Hello, my name is Ashley Barron. I’m an illustrator who likes to dabble in a whole bunch of mediums, but am best known for my paper collage work. 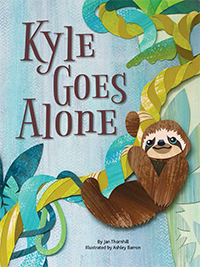 I’m the illustrator of Owkid’s Math in Nature series, written by Lizann Flatt, Kyle Goes Alone, written by Jan Thornhill, and most recently, UP! How Families Around the World Carry Their Little Ones, written by Susan Hughes. My up-coming book, Birthdays Around the World, published by Kids Can Press and written by Margriet Ruurs, is set to release September 2017. I have a second passion involving dirt, water, sunshine, and a sprinkling of luck. I’m a budding, self-taught green thumb who, year by year, absorbs whatever gardening wisdom I can in preparation for my future dream garden. Hello Ms. Barron, I am Lucila Miranda from the Philippines and I was wondering if you would like to participate in an interview, through email, for my thesis? It was nice meeting you (digitally), Lucila. I hope you send me a link to your book project once it’s all done. Good luck! Hi Ashley–my son loved Kyle Goes Alone. It was his favourite book for months. He would pretend to be Kyle and would introduce himself as Kyle the Sloth when he met new people. Our whole family loved your book. Your work made the story come alive. I hope you illustrate another kids book soon!